Take the completely renovated and prepared flagship MS Admiral Tegetthoff departing from Vienna to Tullnand visit the DIE GARTEN TULLN with more than 50 show gardens. It all started with the initiative "Nature in the Garden", launched by the Lower Austrian government. Natural gardening is the main issue of this idea. Lower Austria presents as the highlight The Garden Tulln - Lower Austria's Horticultural Show, which started as a permanent facility in spring 2008. The garden show in Tulln - in close vicinity to Vienna - offers a wide range of attractions. More than 50 show gardens in different shapes and sizes (80 – 800 m²) situated in the beautiful former wetland, now parkland, attract visitors from all countries. Landscaping companies, nurseries and architects created garden ideas of multiple designs with beautiful plants, flowers and shrubs. A lovely rose garden, a wellness garden with a water pond, a farmers´ garden as well as modern gardens for all tastes offer a large variety of different designs. 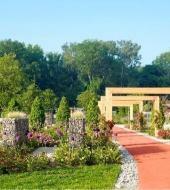 These gardens will show visitors how to design their own gardens and maintain them in a natural and organic way. Ideas can be taken home and realized in the house garden. Please be at the departure location no less than 30mins before your departure time. Entrance fee to "Die Garten Tulln"